10th March 2017 – This was when Varun Dhawan and Alia Bhatt’s Badrinath Ki Dulhaniya hit the screens and emerged as a major Superhit. 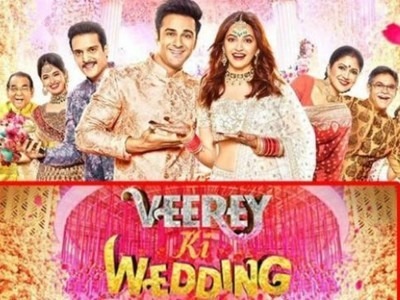 2nd March 2018 – This is when Pulkit Samrat and Kriti Kharbanda’s Veerey Ki Wedding released and is a fun family entertainer. With a similar sounding title as well, Veerey Ki Wedding arrived this wedding season which also coincides with the festival of Holi. Meanwhile, the songs from the film are already out in the form of ‘Mind Blowing’ (which comes across as a quintessential Salman Khan number) and ‘Hatt Ja Tau’ (which is the recreated version of a very popular Haryanvi number up North). What further adds weight to the film is the presence of Jimmy Sheirgill. “He was the villain of the piece in Mukkabaaz and his act was appreciated by one and all. Now in Veerey Ki Wedding though he is playing a strong armed big brother all over again, it can’t really be classified as villainous. Instead, he tries to help his younger brother (played by Pulkit Samrat) to find his ‘dulhaniya’ (Kriti Kharbanda). Hence the film’s titled Veerey Ki Wedding,” our source informs.